Here's a delicious recipe for doughnuts made with sweet potatoes. After you have made them, sprinkle them with confectioners' sugar or roll them in granulated or caster sugar. You will really enjoy these homemade goodies. Sift together the flour and the baking powder. Set aside. Whip the warm mashed sweet potatoes, then gradually add the salt, lightly beaten eggs, sugar, melted butter, nutmeg, and milk, and blend thoroughly. Stir in the flour/baking powder mixture and mix until well blended into a soft dough, as for biscuits. Chill dough well for at least 1 hour. Turn a portion of the dough onto a floured work surface and roll or pat to a thickness of 1/2-inch. The dough should be soft but firm enough so that it doesn't stick to the work surface. Cut out doughnuts with a floured doughnut cutter* (see note below). Lay the doughnuts on a floured baking sheet as you cut them with doughnut cutter. Heat oil in a frying pan or dutch oven on medium heat (oil should be approximately 375 degrees F/190 degrees C) and drop doughnuts into pan of hot oil, a few at a time. Turn doughnuts as they brown. Remove doughnuts from hot oil with kitchen tongs or slotted spatula and place on paper towels to let oil drain off. Repeat making doughnuts with remaining dough. 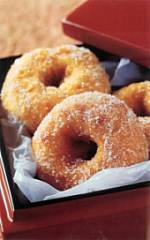 If desired, roll doughnuts in granulated sugar or sprinkle with confectioners' sugar. Doughnuts are best served warm. Note: If you don't have a doughnut cutter, cut dough with a 2 1/4-inch round biscuit cutter. Cut out center of doughnuts with a 3/4-inch round cutter. Makes 3 to 4 dozen doughnuts. time consuming and hard to make, but tasted ok in the end.